I have been deploying and teaching with iOS in a 1:1 school for five full years now. A 1:1 school is a school where each student is provided with a computer in some form for their exclusive use. We started with the original iPad in August 2010 and now, five years later, are getting ready to refresh from our current 4th-generation retina iPad to whatever is current next summer. Over these past five years, we have seen iPad develop from an interesting device with some useful desktop-like apps in the iWork suite to a very powerful platform for student learning and creativity. I have often said that the iPad hardware matters only insofar as it enables you to have an excellent experience of software. Tablets and smartphones are as close as we can practically get to a pure software experience. This is one of the reasons why iPhone and iPad hardware is firstly so minimalist and secondly hasn't changed much in all the years they have been sold. What matters about the iPad is that it makes the software fast, smooth, and powerful. We have seen many more changes in iPad software than we have in the hardware. We started with iOS 3.2 – a version before even multitasking arrived on iOS – and we are now looking at iOS 9. So what does iOS 9 bring for education? The first reason that iOS 9 could be considered an education-focused release is that it has such a focus on iPad. iPad, not iPhone, is the dominant iOS device in the classroom and while the last few releases have not reduced the iPad's capabilities, I have often found myself frustrated that the tablet platform has not received more of a boost than it has had. Almost all of the major iOS 9 enhancements are either exclusive to the iPad or highly relevant to it. A common thing I have seen over the past five years is a pattern that goes like this: a student gets a Bluetooth keyboard for Christmas, carries it to school for six weeks until our February holiday, and never brings it again. Our students use the iPad virtual keyboard almost exclusively and are genuinely happy to produce reports, essays, and other work using it. We have students learning and working all the way up to pre-university qualifications using their iPad for essays, reports, presentations, and all other work. There are two enhancements to the built-in Apple keyboard in iOS 9 that will benefit different parts of the school. The first enhancement is something for our younger users: the keyboard now shows lowercase key caps when the Shift key is not engaged, and uppercase when it is. This is a huge benefit to younger users who don't typically learn the uppercase letter forms until well after they've learned the lowercase letters. The second benefit is the new gestures that allow precise and fast positing of the insertion point in text. Many apps such as Editorial and Pythonista have implemented special techniques to allow swiping to position the text cursor but having it standard and system-wide will be a great benefit. Obviously Apple's apps never supported anything that wasn't vanilla-iOS techniques and Pages is our text workhorse in school. There are two additional keyboard features in iOS 9 which I am looking forward to very much: enhanced support for keyboard shortcuts and Command-Tab app switching. Both of these are intended for and require an external Bluetooth keyboard. I can't predict right now, but I do wonder if these additional efficiencies will prompt more students to reconsider whether they carry an external keyboard. I will certainly be exploring that option myself. The signature iPad-specific feature in iOS 9 is, of course, the new multitasking capabilities. All iPads will get Slide Over and Picture in Picture but Split View (two-up apps) will only be possible on the iPad Air 2 and future iPads. I'll take the latter feature first. As of 2015, this is really more of a marker for the future than an immediate benefit to schools. Very few schools have fleets of iPad Air 2 right now but the presence of this feature on higher end iPads will, I believe, radically change the hardware decisions that many schools will make on their next refresh. For our school, support for two-up apps will be high on our iPad shopping list for our 2016 refresh. I believe that this feature has the potential to change many learning practices in schools. For example, until now, we have not spent much time exploring electronic books. The reasoning from most teachers has been that the iPad is far too valuable a device to "lock it up" in the classroom as a device to read from. We would much rather have the book on paper and the iPad open and ready for the students to create their responses to the learning with. It's entirely possible that the ability to view the book electronically and write about it at the same time will change some of these approaches. Another trend that has taken hold in many 1:1 schools is the use of video for teaching or reinforcing specific points of learning. Our mathematics department, for instance, provides videos of worked examples of mathematical techniques through their iTunes U courses. This is helpful for students to review after class and it also helps parents at home get to grips with the New Math. Many of our students use the built-in Notes app for quick note taking. We don't teach by lecture, so I'm not talking about transcription or summarisation here – just a space to quickly type something into their iPad that they'll be able to find again. 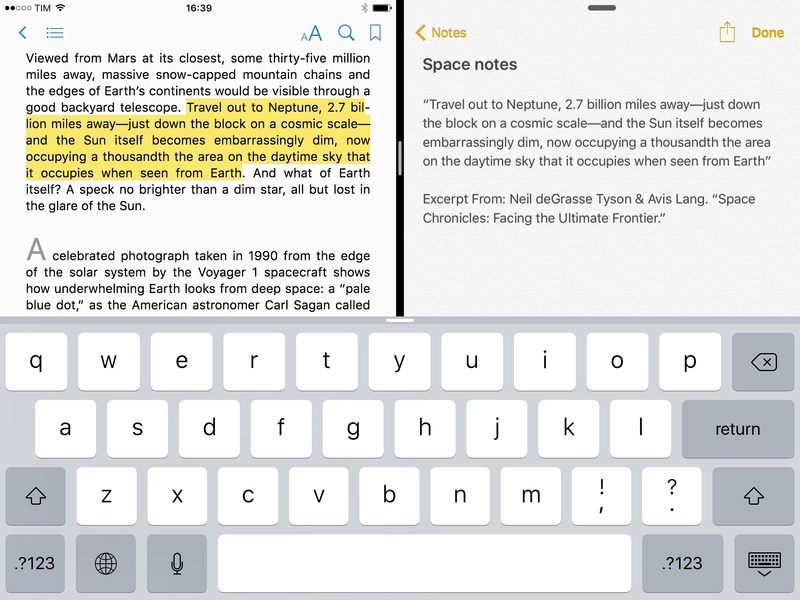 The Notes app in iOS 9 almost looks like it was built with education in mind. Notes now supports inline checklists, which will be helpful for making quick to-do lists in notes. Another big education request for Notes has been support for inline images and this is also now supported. 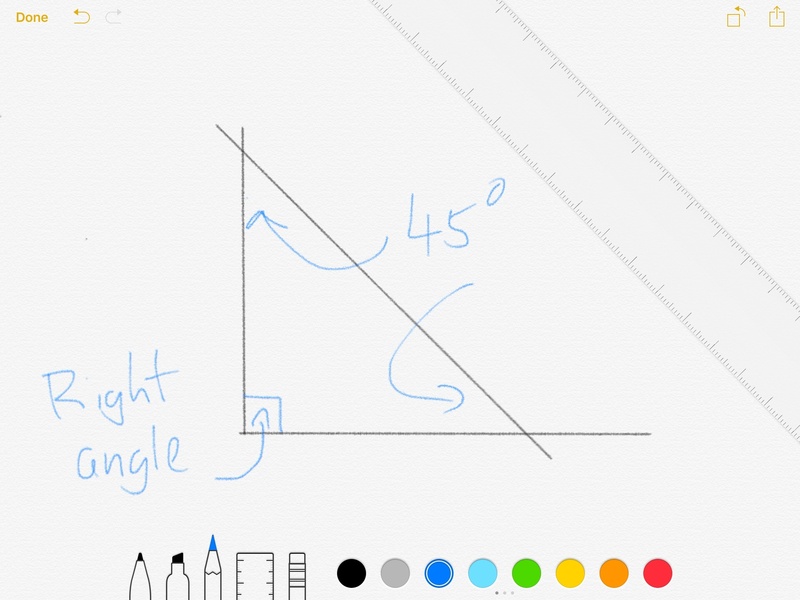 Finally, and perhaps most importantly, Notes now supports sketching in a note. This isn't just a simple digital ink scribble, though. The sketching engine features a pen, pencil, and highlighter as well as an eraser and, most helpfully, a multitouch ruler. The ruler allows the student to draw perfectly straight lines and has dragging detents at 0°, 45°, and 90°. Maths departments everywhere can rejoice! One of the major issues in school IT has always been the problem of keeping devices – usually laptops – charged. The iPad, with its 10-hour battery largely solved that problem for us. Still, there are always one or two students who forget to charge their iPad. Apple promises an extra hour of battery life under iOS 9, and this will be most welcome for all of us. School sysadmins, too, will appreciate many of the additional low-level management features that are coming in iOS 9. I'll write about those in a separate MacStories article this week. Fraser is a teacher and well-known public speaker at events such as the Apple EU Leadership Summit, Abilene Christian University’s Connected Summit and Macworld Mobile. He regularly works with schools around the world focusing on next-generation educational technology, teaching practice and curriculum. Cedars School of Excellence is known as the first school in the world to roll out the Apple iPad on a 1:1 basis. Fraser is the Head of Computing and IT at Cedars and was responsible for the planning and execution of that project.